I'm back from my weekend away and it proved to be everything that I had hoped for. I have a good few posts and lots of pictures to put up here which I will do over the next couple of nights. Before that though I thought I would mention something a lot more local. After arriving back on Sunday evening we noticed a plume of smoke coming from the Gower peninsular but thought nothing of it. As darkness fell things got a lot more interesting as it became apparent that a very large fire had taken hold towards Llangennith. The orange glow from the flames was clearly visible from my house on the other side of the estuary so we decided that it was worth a trip over to see what was going on. We followed a fire engine for most of the journey which soon pulled over to join a general assortment of emergency vehicles. 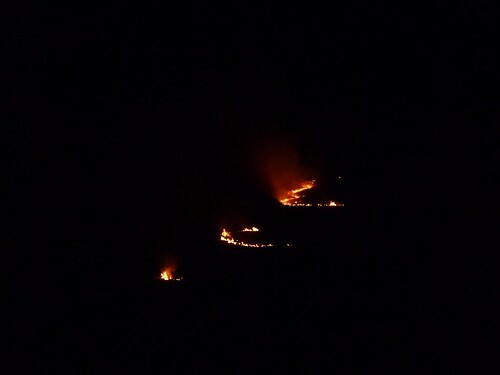 The fire we found was covering the majority of the hill behind Llangennith and was noticeably moving towards us during the brief time that we spent there. 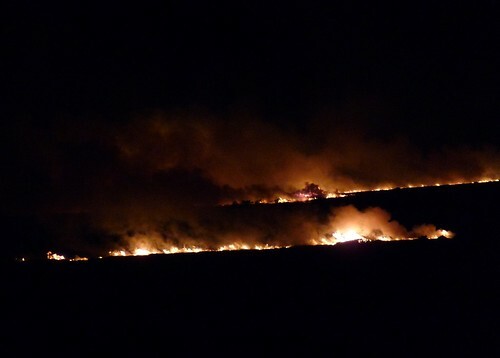 Apparently this was the second fire of the day in this area (the first being on Rhossili downs), and both had covered an area of some 100 hectares each. Local reports seem to indicate that both fires were acts of arson which is just unbelievable. 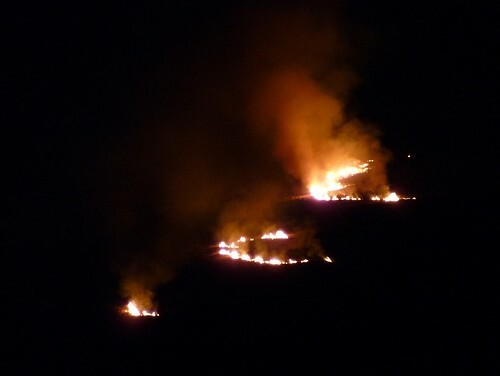 We are now on Tuesday night and there are fires burning over most of Gower at present. There are a couple of outbreaks around Llangennith still, though these seem to have moved even further inland than the one we witnessed on Sunday. 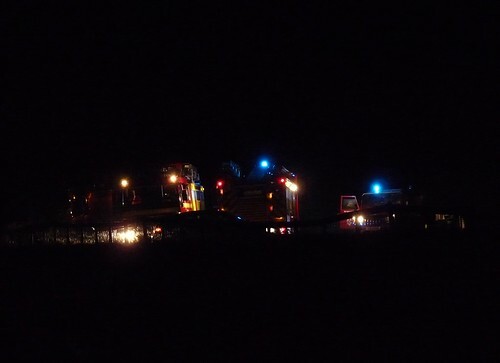 There is also now a large fire at the base of Cefn Bryn as well as to the rear of Swansea airport. I am not sure if these are legitimate burnings started by farmers but the fire brigade are certainly out and about doing patrols. Given the dubious nature of the fires on Sunday I am inclined to regard these latest outbreaks with suspicion. Over the past couple of years there have been small outbreaks of fire but I have never seen anything on this scale or over such a large area. I only hope that they can be brought under control swiftly before the damage becomes even more severe.